Remember the Yenko 2017 Chevrolet Corvette Grand Sport that debuted during the Barrett-Jackson auction in Scottsdale, Arizona earlier this month? The company behind the car, Specialty Vehicle Engineering of Toms River, New Jersey, has since dropped its supercharged V-8 into the engine bay of the Chevrolet Camaro. The result is the Yenko 2017 Camaro, which we’re glad to report matches the 800 horsepower and 750 pound-feet of torque of its Corvette cousin. Note, the modern Yenkos aren’t related to the famous muscle cars from Yenko Chevrolet of Canonsburg, Pennsylvania. SVE uses the name under license from owner General Marketing Capital Incorporated. 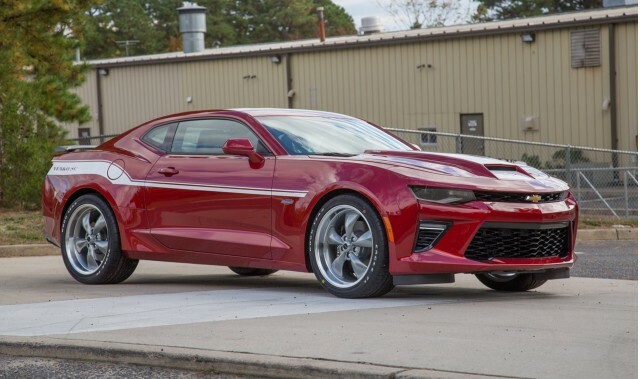 The Yenko 2017 Camaro is based on a Camaro SS and buyers can choose between the car’s coupe and convertible body styles as well as between its 6-speed manual and 8-speed automatic transmissions. The donor car also brings plenty of track-friendly goodies such as Magnetic Ride Control suspension, powerful Brembo brakes, and differential cooling systems. Among the upgrades is a rebuilt LT1 V-8 that now features a supercharger and displaces 6.8 liters instead of the standard 6.2 due to a stroker kit. SVE also replaces the crankshaft, H-beam rods and pistons with stronger pieces and swaps in the beefier fuel system and injectors from the Corvette Z06. Visual tweaks include custom badging and decals as well as chunky 20×10-inch heritage-style wheels wrapped with Goodyear Eagle F1 tires. The interior can also be dressed up with a leather package as well as custom door sills and floor mats. Interested buyers better be quick as SVE will build just 50 examples for the 2017 model year. Yes, Photo Client, You Do Have ALL of Your Pictures!